With the goal to build long-term, sustained engagements with artists inclined to materialize their respective aesthetic goals, studio Shunno and Corridor Foundation designed this series of collaborative workshops in 2013 to ensure a convergence of practice and theory. 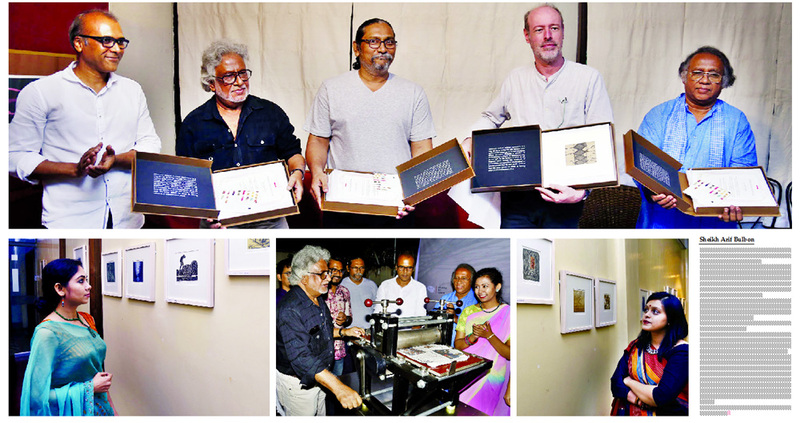 The launching of Shunno’s graphic print folio series, ‘Apostrophe’ and mobile mini-press was held on May 11 at Alliance Francaise de Dhaka in the city’s Dhanmondi area. Eminent artist Monirul Islam inaugurated the event as the chief guest. Nineteen emerging artists participated in the workshop for 10 days and produced 116 plates. From these works, only forty plates were selected and curated to be published as portfolios. Apostrophe features works by Jamil Akbar Shamim, Syed Zahid Iqbal, Tahmina Hafiz Lisa, Farzana Ahmed Urmi, Fatima Khatun, Tejosh Halder Josh, Sajal Das, Md. Kamruzzoha, Emran Sohel, Umme Sohag, Jafrin Gulshan, Iqbal Bahar Chy, Khalequzzaman Shimul, Sadya Mizan, Manik Bonik, Kuntal Barai, Jahid Hasan, Lamia Azad, and Opper Zaman (listed in order of seniority).